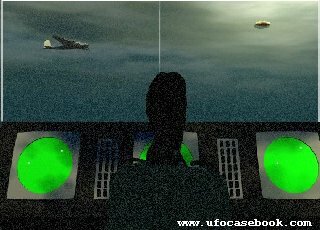 MINOT AIR FORCE BASE - Project Blue Book case dated October 24, 1968, when missile crews, control personnel and maintenance personnel observed a UFO in the vicinity of the base. The following is the tape between the air controllers and the B-52 crew with call sign JAG Three one. At 0330 hours: The controllers received the information that there was a UFO 24 miles to the northwest. A B-52 jet bomber (JAG 31) flying at 2000 feet was on a calibration check and requests a clearance from radar personnel. At 0334 "MIB (Minot) approach control does JAG 31 have clearance to WT fix at Flight Level 2000?" JAG 31, Roger climb out on a heading of 290 climb and maintain 5000. Stand by for higher altitude. We're trying to get it from center now. At 0352, The controller then radioed, "Three one, the UFO is being picked up by weather's radar also. Should be at our one o'clock position three miles now"
The pilot said, "We have nothing on our airborne radar and I'm in some pretty thick haze now and unable to see out that way." At 0358, the pilot then requested an instrument guided approach, and received instructions. The pilot called, and then the transmitter went dead, but they could hear instructions from the ground. The controller asked them to squawk ident," which meant to use the aircraft's transponder which would paint the controller's radar with a large, glowing blip with the aircraft's identification. At 0400, the controller then radioed, "JAG 31 if you hear me squawk ident...JAG 31 ident observed. Cleared for the approach attempt. Contact on frequency 271 decimal three and you're cleared for the low approach. They continued to have radio problems for another couple of minutes. At 0402, they were able to communicate easily. The pilot said, "Our UFO was off to our left side when we started penetration. "Roger, understand you did see something on your left side." "We had a radar return at about a mile and a quarter, at nine o'clock position for about the time we left 200 to 14..."They discussed the troubles with the transmission and then, the controller asked, "Affirmative. I was wondering how far out did you see that UFO?" "He was about one and a half miles off our left wing at 35 miles when we started in and stayed with us 'til about 10." "I wonder if that could have been your radio troubles?" "I don't know.... But that's exactly when they started. "At 0413, Jag 31 are you observing any more UFOs? Negative on radar. We can't see anything visually. JAG 31, request you have someone report to base ops after you land. What we have, then, was a group of sightings made by men on the ground, at the missile sites scattered around the base. There was radar sightings from ground and weather's radar. There were visual sightings from the crew of the B-52, and an airborne radar sighting where the target traveled at 3,000 miles per hour. Scope photographs were taken. There were sightings made by S.Sgt. Bond the FSC at Nov. Flight, S.Sgt. Smith at Oscar-1, Julelt, and Mike Flight Team and a number of men in widely scattered locations. The object landed at location AA-43 and the entire observation lasted for 45 minutes. Fourteen other people in separate locations also reported the UFO. Security alarm were activated for both the outer and inner ring at the missile sites. When the guards arrived at the outer door it was open and the combination lock on the inner door had been moved. Editors Note: The case in my estimation was never investigated properly. Project Blue Book personnel never sent a representative and the case was essentially written off despite the interest of several Strategic Air Command generals including 15th Air Force's Major General Nichols. The sighting was officially explained by on November 13, by Lt. Col. Hector Quintanilla who wrote, "The following conclusions have been reached after a thorough study of the data submitted to Foreign Technology Division. The ground visual sightings appear to be of the star Sirius and the B-52, which was flying in the area. The B-52 radar contact and the temporary loss of the UHF transmission could be attributed to a plasma similar to ball lightning. The air visual from the B-52 could be the star Vega, which was on the horizon at the time, or it could be a light on the ground, or possibly a plasma. No further investigation by the Foreign Technology Division is contemplated. This is a classic Blue Book case where dozens of Air Force personnel who see B-52s and stars nightly have their testimony doubted. They know when they've seen a UFO. In this case the scientists doing the Condon report agreed that this was a real UFO. The apparent damage to the missile site and disruption of B-52 radio transmissions was in my opinion a threat to primary nuclear offensive systems and should not have been trivialized. The records speak for themselves. This article was taken from Scientific Ufology written by Captain Kevin D. Randle USAFR. I consider this his finest book and recommend its reading. This case like thousands of others are explained away with any simple mundane explanation that can be found. Yet many cases involve the tampering of key government weapon systems. It appears Quintanilla either did not care or had instructions to write off most of the sightings with any available excuse. I wonder why the reports were white washed, while the Air Force's scientific advisor Alan Hynek was coming to the opposite conclusion that, UFOs were real? Captain Kevin Randle book "Scientific Ufology"